Outstanding amateur star Antonio Counihan is set to make his highly anticipated professional debut, on the Dave Murphy, in association with Acourtier Events, promoted ‘Independence Day’, Retzke-McKenzie World Championship headlined extravaganza, at York Hall on Friday, 5th July 2013. During his outstanding amateur career Antonio fought eighty competitive bouts, fifteen of which were Team GB Internationals, as well as had the honour of Captaincy of the England National Amateur Boxing Squad bestowed upon him. Unsurprisingly theSolihull youngster accrued numerous national accolades along the way, including winning the Junior ABAs, The Great Britain Championships and the Haringey Box Cup. For his debut fight young Antonio has been set the challenge of facing six fight veteran Arturas Zbarauskas from Lithuania, a fact that clearly doesn’t faze Antonio one iota, as was made clear when he spoke earlier. 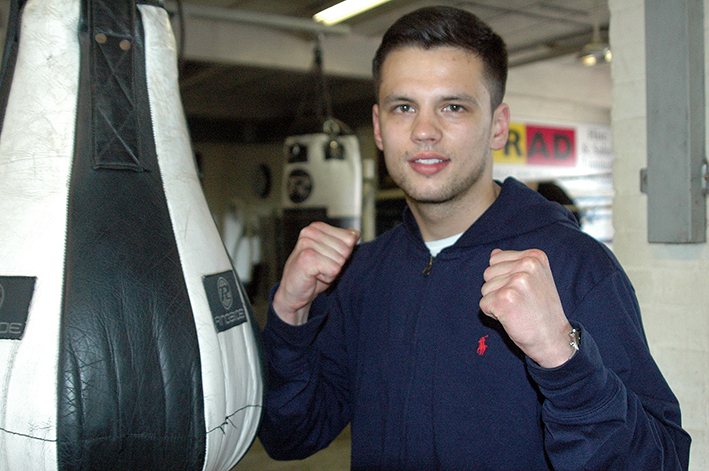 “I’ve been waiting a long time for my debut, I can’t wait to get in there now. I don’t know anything about my opponent, other than he has had six pro fights, that’s not a problem as far as I’m concerned. I’m really looking forward to my first pro fight. I had a pretty good amateur career, but always felt that my style would suit the pros better. I enjoyed boxing as an amateur but at the end of the day boxing professionally is what I’ve always wanted and now thanks to Dave Murphy having me fight on his July 5th show I’m finally getting the chance to live my dream. Training’s been going great, I’ve been training in Birmingham and coming to the TRAD TKO in London for sparring. I’m as ready as I’m ever going to be. It’s really exciting, I’m bringing a lot of fans down to London, I know they can’t wait either as we’ve already got two coaches coming down. Antonio Counihan versus Arturas Zbarauskas is set to feature on the support card of the historic Female Light Middleweight World Championship battle between Jennifer Retzke and Angel McKenzie headlines the Dave Murphy, in association with Acourtier Events, promoted ‘Independence Day’ event, which takes place at York Hall in Bethnal Green, London, on Friday 5th July 2013.